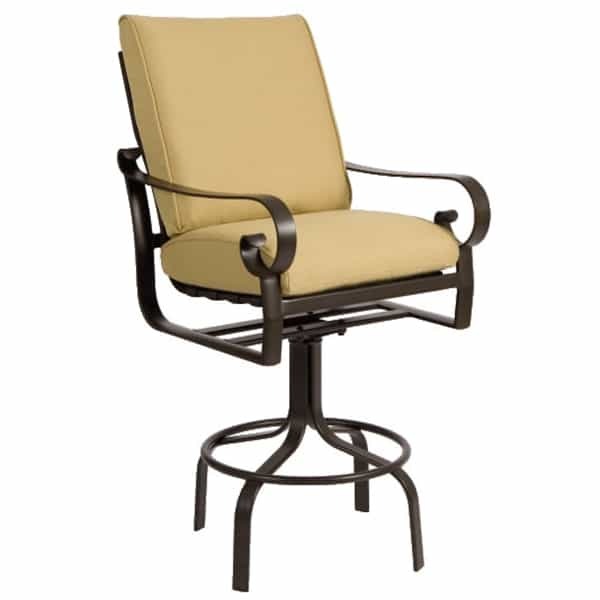 If you desire memorable patio furniture out on your deck, porch or patio, then you must consider the Belden Cushion Bar Stool from Woodard. This bar stool showcases a timeless design that offers modern style mixed with traditional elements, such as the hand rests that appear to be scrolled like old manuscripts. Woodard craftsmen bend and shape these bar stools by hand, creating wonderful pieces that feature an individualized feel. And while classic motifs are present, this bar stool is totally current offering modern aluminum that's powder coated in a state-of-the-art process that creates advanced, all-weather function. Place this bar stool outside in the elements without fear that the timeless look will fade after exposure to rain and wind; Woodard is so confident with this process they offer various warranties. Be sure to ask about them when you call for pricing! W 26.3" x D 33.5" x H 35.5" LBS 27 SEAT HEIGHT 21"
W 26.3" x D 33" x H 35.5" LBS 32 SEAT HEIGHT 21"